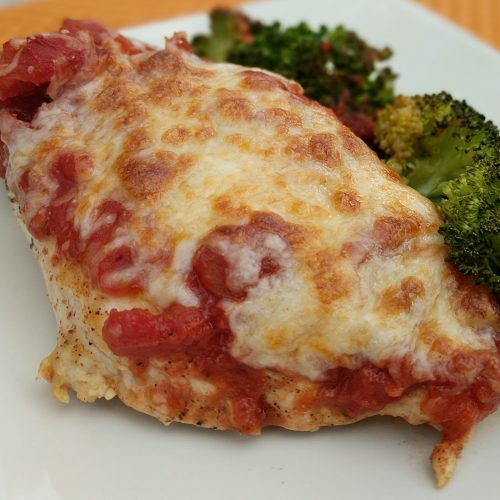 This Baked Chicken Parmesan is the healthy alternative to your Grandma’s classic recipe. I am Italian and could pound pasta for days straight (heck, I did as a kid growing up!) However, now that I am older my body doesn’t respond as favorably to pasta as it used to. I need to find ways to make my childhood favorites healthier for this ageing body. 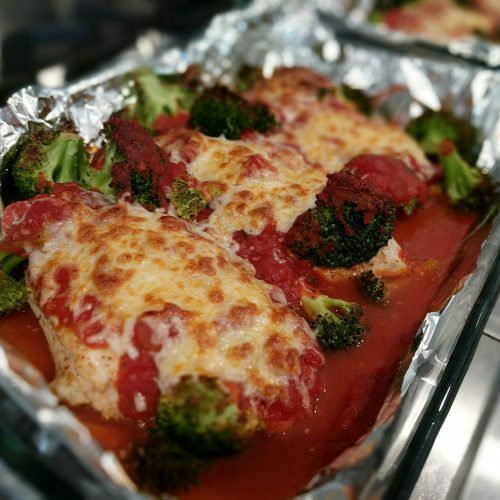 This Chicken Parm is the answer to that Italian craving. It is simple and delicious. It is seasoned and baked instead of breaded and fried. It is low cal, low carb, low fat and high protein! Ding ding ding ding!!!! We have a winner folks!! For a 7 oz serving of chicken it is only 299 calories, 8g carbs, 6g fat and 54g of protein!! Now I would say that is protein packed!! 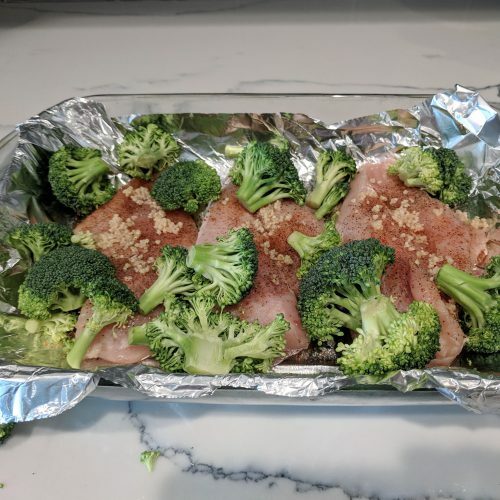 I made my recipe with broccoli but you can make it with whatever veggies you prefer. 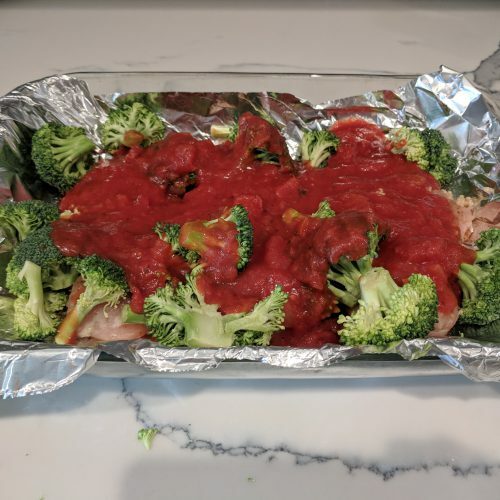 I baked the broccoli with the chicken but you can also cook it separately according to the package instructions (I will probably do that next time!). 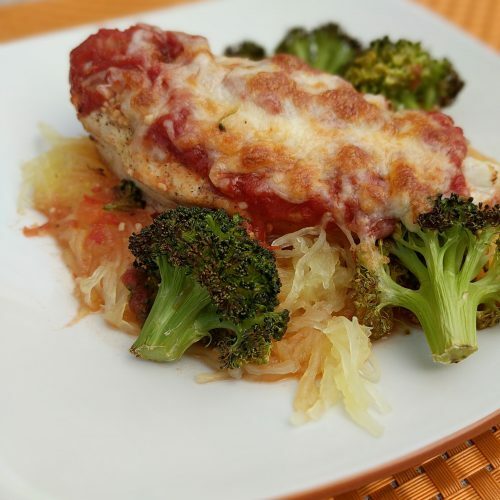 I served the chicken parm over spaghetti squash but you do not have to do that either! 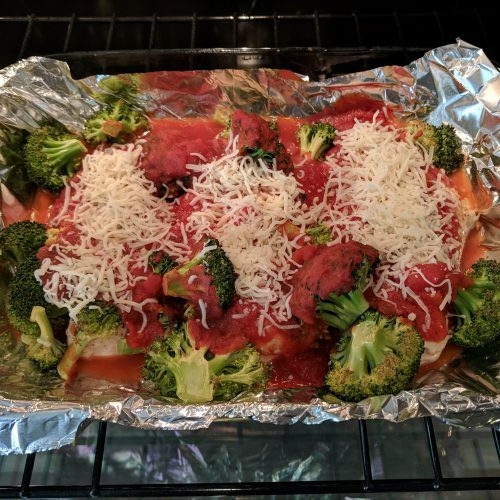 You could serve it over cauliflower hash as a nice and more filling alternative (it’s just “less italian” that way LOL) or just let it fly solo with the broccoli! For the sauce I used Classico Spicy Red Pepper (see image below) because I like a little kick (there’s barely one) and because for a jarred sauce the stats are great. Per serving there are only, 45 calories, 1.5g fat, 7g carbs and 4g sugar. That is pretty dang good for a jarred sauce! 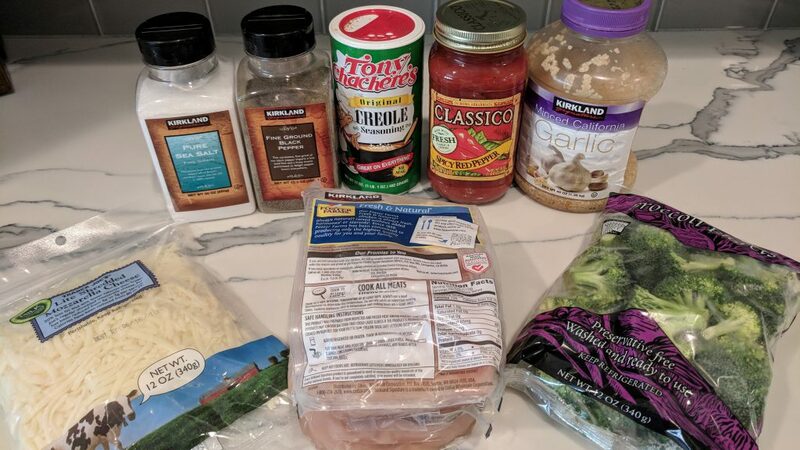 You don’t have to use that same brand/kind but if you switch it up look for a sauce that has less than 8g sugar. This recipe is gluten-free, super easy and most importantly… healthy! 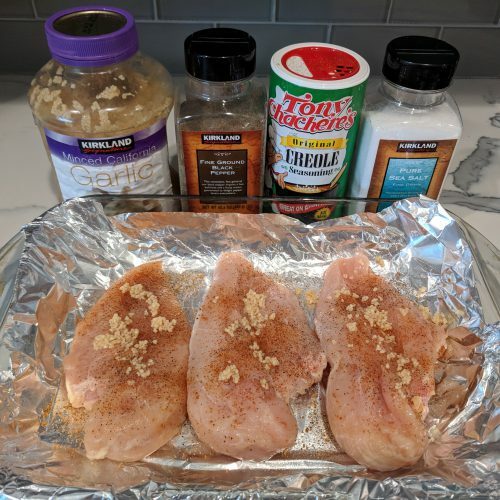 If you love this recipe, try my Baked Brown Sugar Garlic Chicken! 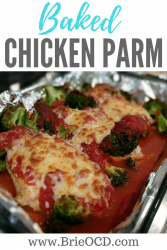 a healthy alternative to breaded and fried chicken parm! preheat oven to 450 degrees. 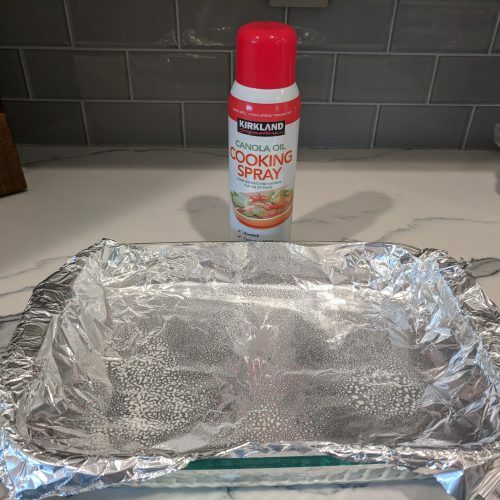 line a baking dish with foil and coat lightly with cooking spray (for easy cleanup). 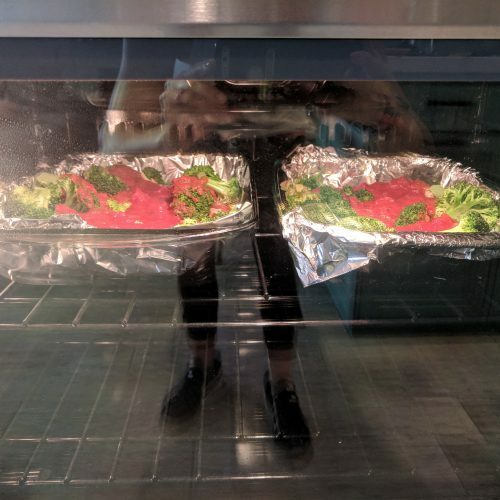 I actually used two 13x9 baking dishes because there was so much chicken! lightly sprinkle chicken with creole, salt and pepper. flip chicken and repeat. 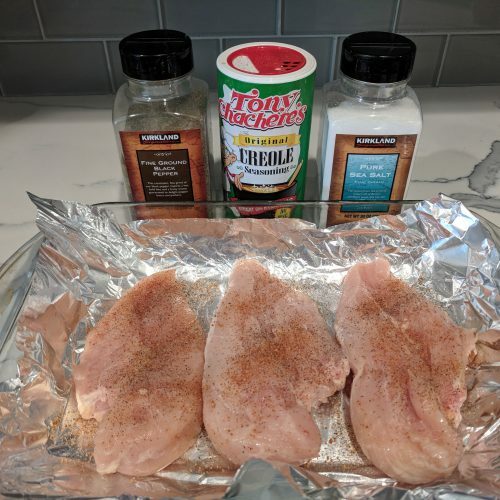 place seasoned chicken breasts in baking dish. scatter 1 tbsp of minced garlic over chicken breasts. bake at 450 degrees for about 20 minutes or until internal temperature of chicken reaches 165 degrees. (time will depend on thickness of your chicken). with 5 minutes remaining on the timer, top with low fat shredded mozzarella cheese. serve with broccoli, spaghetti squash, cauliflower hash or any other healthy veggie! Enjoy! Really yummy and very easy!